Reigning Turkish Airlines Euroleague champs Olympiacos Piraeus picked up its fifth consecutive win after downing Besiktas JK Istanbul 60-79 at Abdi Ipekci Arena on Thursday. The Reds improved to 6-3 in Group F, and could be in a share of second place at the end of the night if results go their way, while Besiktas remains winless in its first ever Top 16 appearance. Olympiacos took the lead for good at the start of the second quarter as Vassilis Spanoulis fueled a 7-22 spurt that gave the visitors a double-digit advantage, which they controlled the rest of the way. 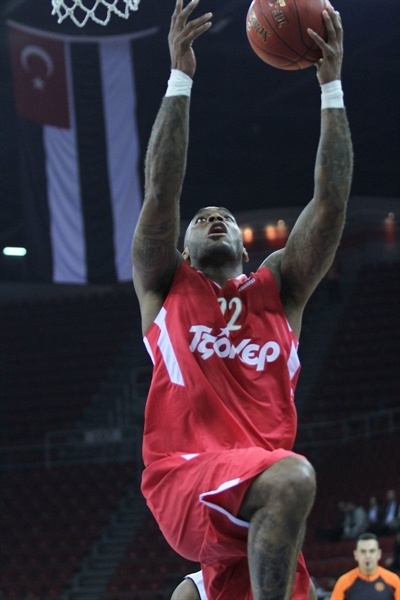 Josh Powell led in victory with 16 points on 7-for-8 two-point shooting. Kostas Papanikolaou netted 11, Spanoulis finished with 9 points and dished out 8 assists, while Georgios Printezis had 9 points plus 8 rebounds. 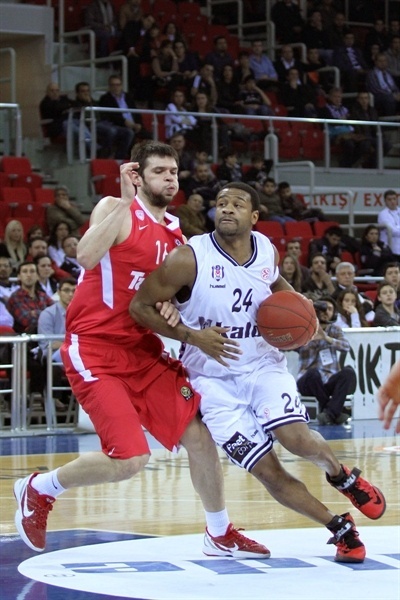 For Besiktas, Gasper Vidmar collected 13 points and 7 rebounds, while Patrick Christopher also scored 13. Randal Falker added 11 points plus 9 rebounds, and Ricky Minard also chipped in with 11 points in defeat. The teams’ respective centers, Powell and Vidmar, split free throws to open the scoring. Spanoulis found a cutting Powell for the first basket before Ricky Minard gave the hosts the lead with a basket-plus-foul. Second-chance baskets by Vidmar and Damir Markota extended the lead to 8-3. 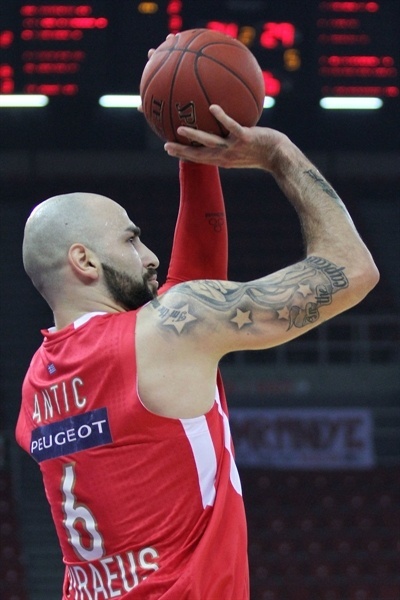 Olympiacos responded with back-to-back dunks from Powell and a layup from Printezis to surge ahead 9-11, but Besiktas held on for a 15-13 lead at the end of the first quarter after Vidmar’s two-handed slam and fastbreak baskets from Fikret Akin and Cevher Ozer. Kyle Hines opened the second quarter with a basket-plus-free throw, and after Ozer replied by nailing a triple, Olympiacos went back in front with Hines sinking a jumper and Pero Antic scoring inside. The Reds went on a run fueled by Spanoulis who first made all 3 free throws after drawing a foul behind the arc, then assisted Papanikolaou and Kostas Sloukas for threes and dished the ball for a Powell dunk and a 24-31 lead. The margin reached 26-38 with Papanikolaou making a put-back dunk and sinking a triple on back-to-back possessions before Randal Falker and Minard scored from close range to make it 30-38 at the break. After Giorgi Shermadini split free throws to start the third quarter, on the other end Akin made a layup and Christopher nailed one from downtown to bring the hosts within 35-39. 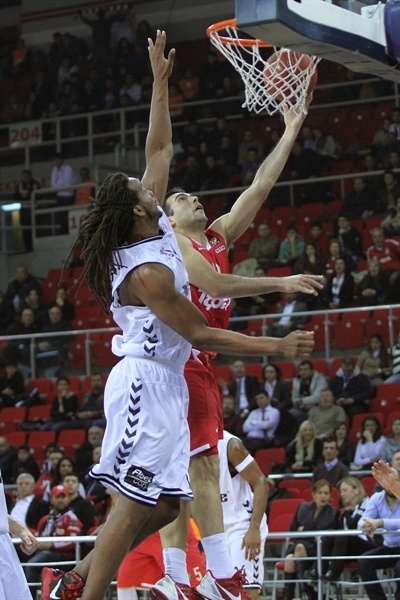 But Spanoulis replied with a triple and after Powell’s mid-range jumper, the margin was back in double figures. Vidmar snapped the visitors’ run with a dunk and added a basket-plus-foul to his tally, but Printezis and Papanikolaou nailed three-pointers before Acie Law made back-to-back layups for 42-56. Besiktas, however, kept its hope alive with Christopher’s triple and a dunk from Falker making it 51-60 going into the final 10 minutes. Powell and Christopher traded jump shots to open the fourth quarter, before Stratos Perperoglou made a runner that helped the visitors extend it to 53-66. While holding a commanding lead, the Reds slowed down the tempo and controlled the boards to keep the hosts at bay. Perperoglou added a jumper and a fastbreak layup to make it 56-74 and seal the deal. Before the final whistle, Minard hit a jumper on one end and a Perperoglou layup and Hines jumper extended it to 58-78, the biggest lead of the night.